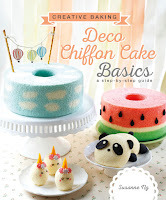 I am so excited to present to you the sixth book in our Creative Baking series -- Deco Choux Pastries! Please click on this link to preorder from Kinokuniya. 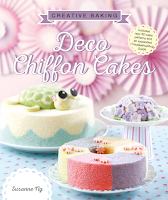 Although this book comes after the chiffon cakes and macarons cookbooks, I first ventured into making non-traditional choux pastry designs in mid 2014, and saw the huge potential for creative expression back then. I just didn't have the bandwidth to focus on developing this area until I made a deliberate effort to make time for it in early 2018. Let me share with you why I am so excited about Choux pastries. I love the complementary textures and flavours of the crisp outer pastry case and cold and creamy filling! It's like party in your mouth as you take time to savour the flavours and textures 😊. 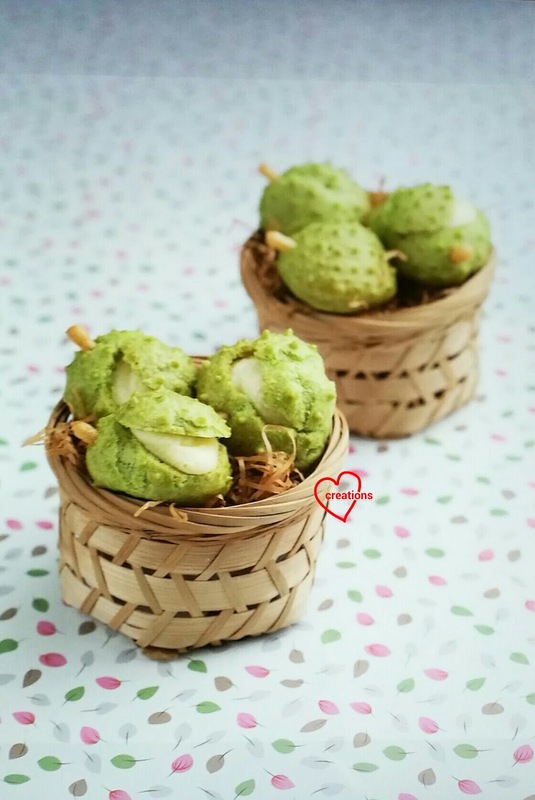 In terms of technical difficulty, Choux pastries are easier than chiffon cakes and macarons as you don't have to deal with meringues and you don't need to have sophisticated equipment like electric mixer or candy thermometers. Even people who don't bake often are able to get it right the first time as seen from my Choux pastry classes! Choux pastries contain much less sugar than chiffon cakes and macarons, and you can even make it totally savoury! Only a few basic ingredients are needed to make choux pastries and steam power is the source of raising agent. No artificial chemicals are used! 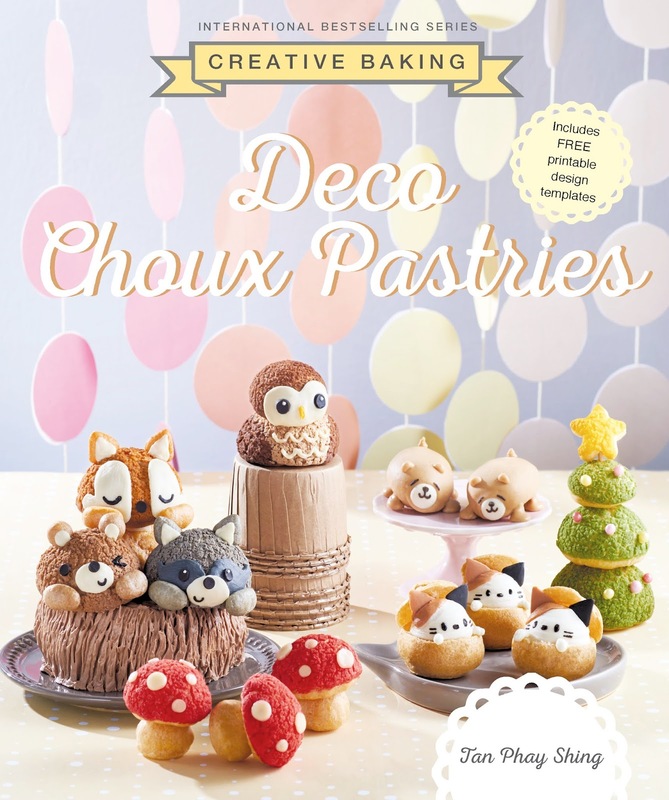 Deco Choux Pastries is a full length recipe book with 30 different designs, unlike our shorter Deco Chiffon Basics and Macaron Basics books which have only half that number. 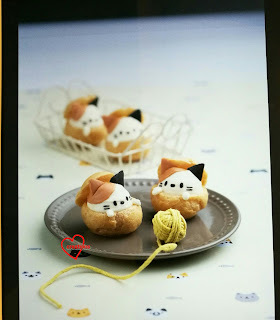 Like all the previous books in this series, I cover the basics, ingredients and equipment, frequently asked questions, recipes for various fillings (savoury as well as Asian flavours are included!) and storage. Printable templates are provided, along with the recipes for each design. 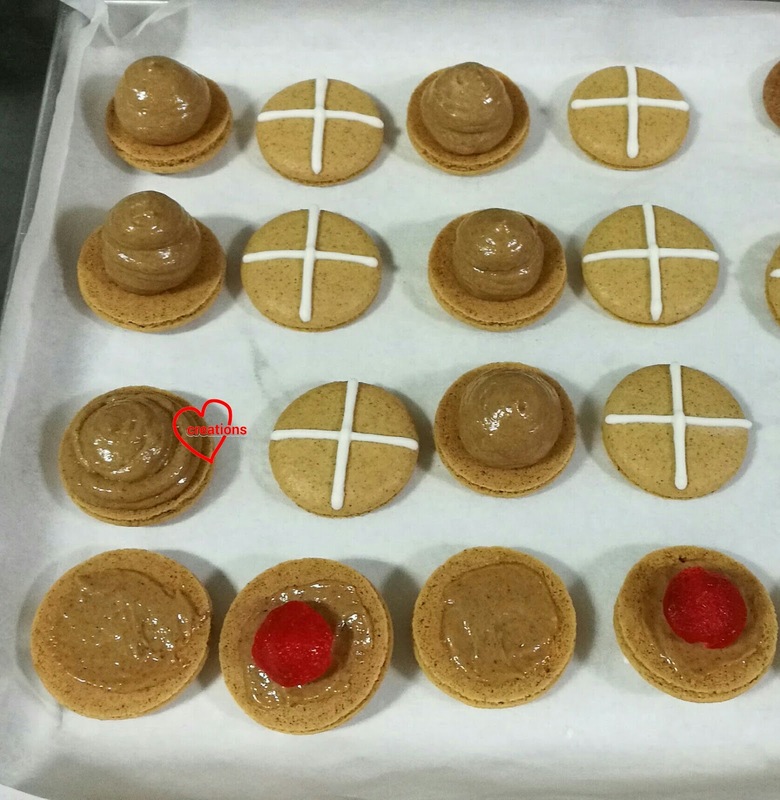 The designs are divided into four sections -- basic, chocolate coated, Craquelin coated and assembled choux pastries. There are a few video tutorials that I made to provide better visual aids than still photos. The QR code can be found in the respective pages of the book. 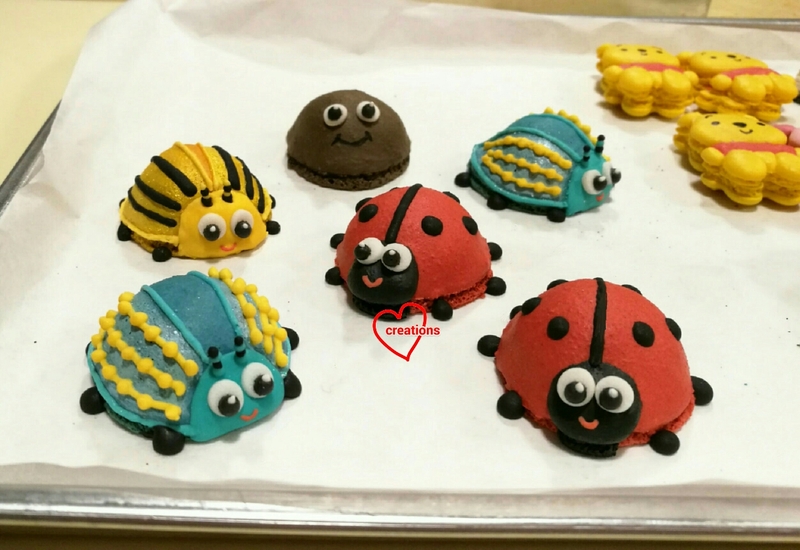 Unlike the few deco choux pastry designs that are already around in specialty cafes, I try to use Choux pastry itself to create as many features as possible, instead of relying on fondant or chocolate. Here is a sneak peek at the photoshoot sessions which spanned over three consecutive days. 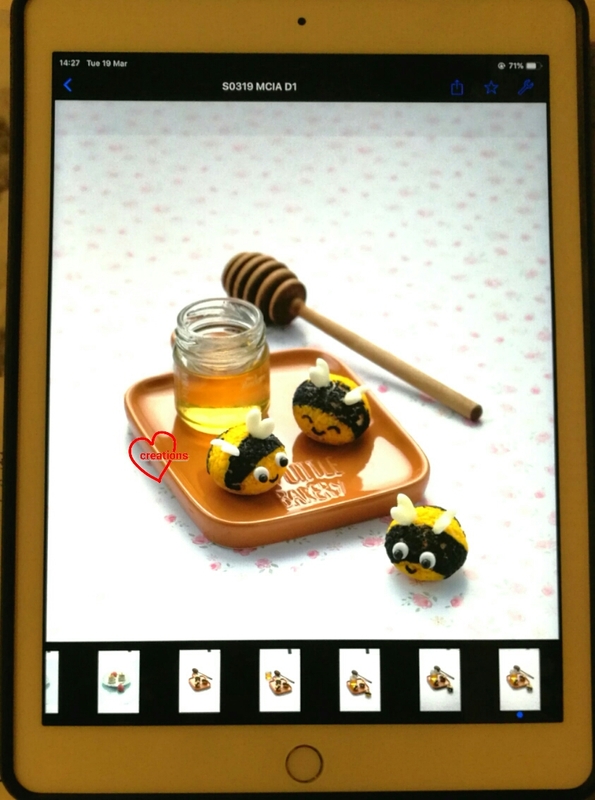 Bear in mind that these are photos of raw photos on the photographer's tablet so the quality of pictures will be much better in the book. It was tiring but I was charmed by how whimsical the whole thing was! 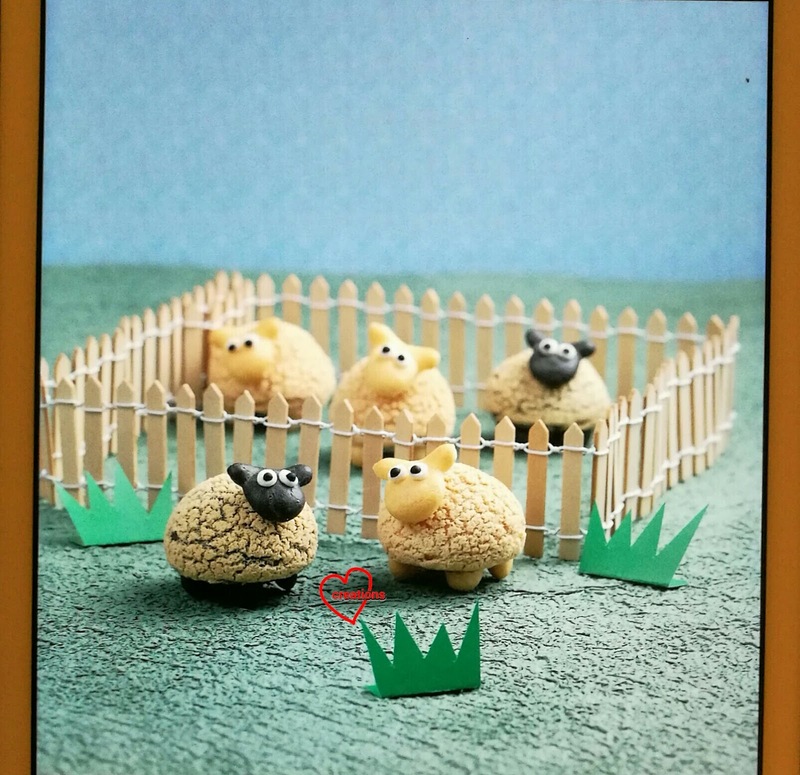 Sheep that look slightly puzzled. As well as simple and elegant. Are you excited about getting a copy of this book? I will update this blog post in the future for various book launch dates and possible book event in June. Sometimes I get unusual requests and this is one of them. 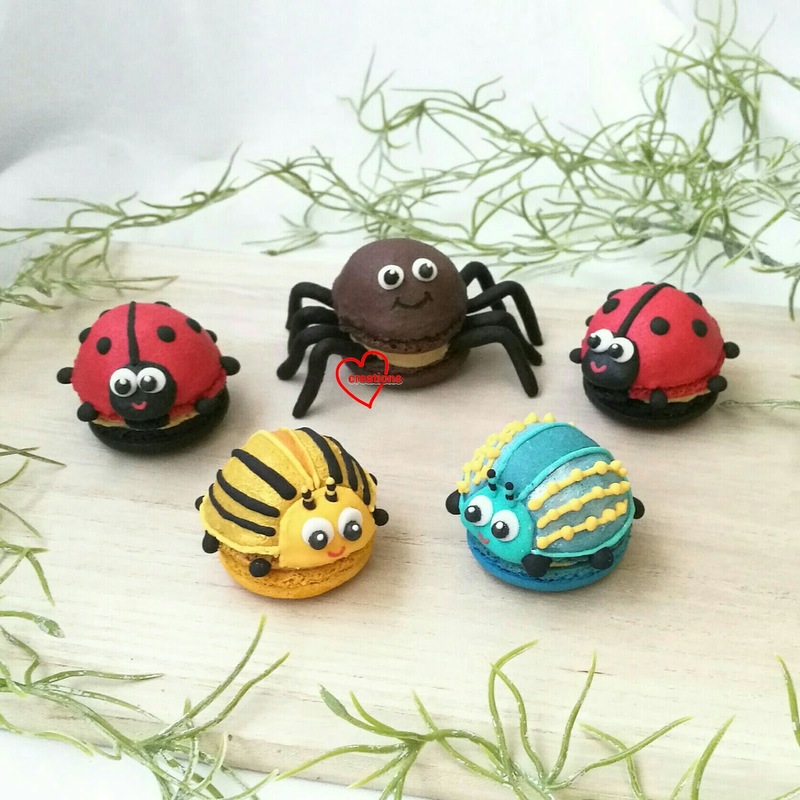 Bug themed macarons. Filled with coffee flavoured filling. For a kid 😱. I go 😱 because there are more parents being concerned about feeding kids tea flavoured bakes from me because of the caffeine content but this kid wants coffee! Anyway I am using decaffeinated coffee here so there's the flavour but without the high caffeine content 😆. I gave my own take on what bug macarons should look like. 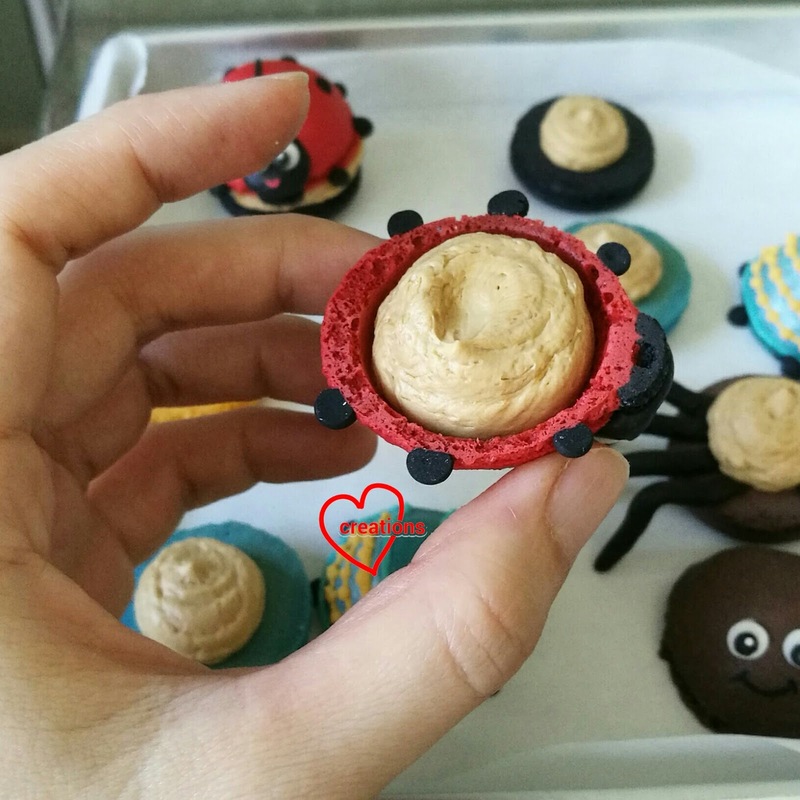 Proper roundish bug shaped of course, made using hemispherical macaron shells! These macarons were made concurrently with those for a cake topper. I used a reduced-sugar Swiss method recipe for this. Ingredient list for the reduced-sugar Swiss method recipe can be found here and the detailed steps can be found here. In order to create the hemispheres, I use an upturned silicone mould. It's a little tricky to pipe on a curved surface but definitely doable. I have used this to make teacups and many other designs. You may refer to this post on how to pipe on a curved surface. I have a video tutorial in there. I decorated the macaron shells using royal icing to make them look more bug-like. I made my own modelling dark chocolate. You may refer to this post for the instructions. Feel free to scale up or down the recipe for the filling below. 1. Heat heavy cream in a small microwaveable until hot. Dissolve coffee powder in it. 2. Add butter and white chocolate and mix well. Heat in microwave oven at medium power for 10 seconds. Mix well. Repeat heating and mixing as necessary until everything is smooth and melted. Alternatively, you may use the stove for this. Be careful not to overheat the chocolate. 3. Add salt and coffee liqueur and mix well. Chill until you are able to scoop it out like ice cream. About 15-30min. 4. 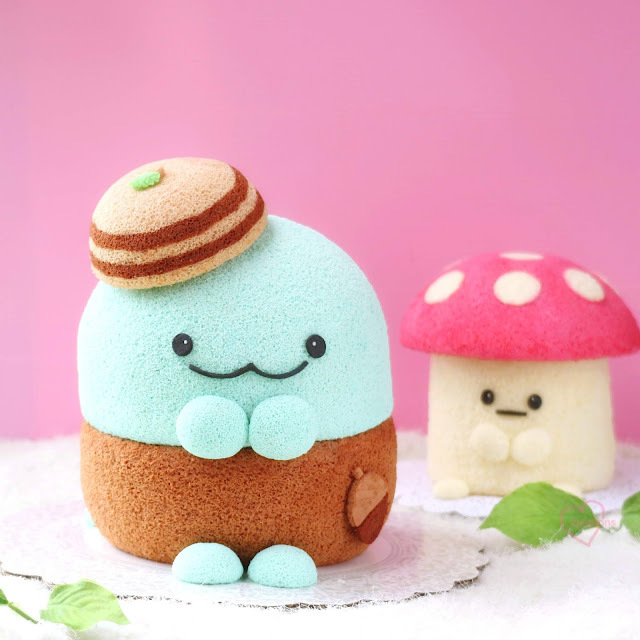 Whip by hand using spatula or use an electric mixer to beat until light, smooth and fluffy. 5. Transfer to piping bag and fill the macaron shells. Let the assembled macarons rest in the fridge for at least 24h in airtight container before consuming. Filling the hemisphere with coffee ganache! I will be teaching this item, Rainbow Chiffon Cake Pops at the upcoming Culinary Arts Ministry this Sunday for church. I was inspired to make these as Easter is coming, and I was reminded of God's promise and His love for us. The flavour is Coconut Pandan as this is one of my fave local flavours still. I will be sharing the recipe below for the reference for those interested who want to try it at home =). Hope you will be reminded of the pretty rainbow that God made as a covenant that he would never judge the world again by a flood, a sign of God's mercy and love. 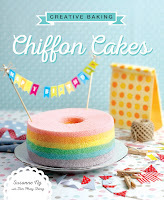 This is somewhat a simpler and smaller version of my Chiffon Cake Rainbows (in Creative baking: Chiffon Cakes), which is in a different flavour (vanilla) and uses a chiffon tube pan. 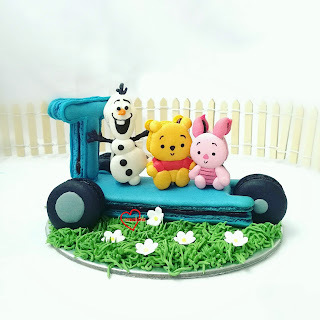 So hop on onto the book (book cover will be at the bottom of the post) if you want to try a giant cake version =). b. Add in coconut oil, water and pandan extract and mix well. You can also substitute water + pandan extract with pandan juice. 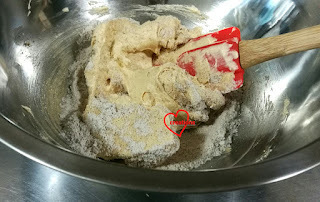 c. Whisk in sifted cake flour till no lumps are found. 4. Divide out the egg yolk batter as follows: 5 tsp pink, 4 tsp yellow, 2 tsp green, 1 tsp blue. You need the most batter for pink which is on the outer ring, and least batter for blue which is right as the base. 6. Portion out the meringue as follows: 10 tbsp pink, 8 tbsp yellow, 4 tbsp green, 2 tbsp blue. Gently fold in meringue into respective egg yolk batter 1/3 at a time. 7. Fill each colour into 4 piping bags. Pipe a rainbow layer starting with pink on the outer most and blue innermost. 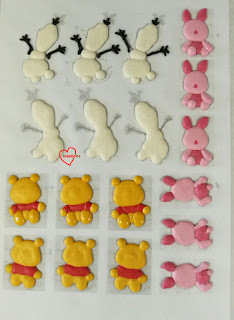 Repeat each colour 3x (3 layers), till the batter is around 1-cm thick. 8. Bake at 140°C for 18 min, or until skewer inserted into centre of cake comes out clean. 9. Allow cakes to cool before unmolding. 10. 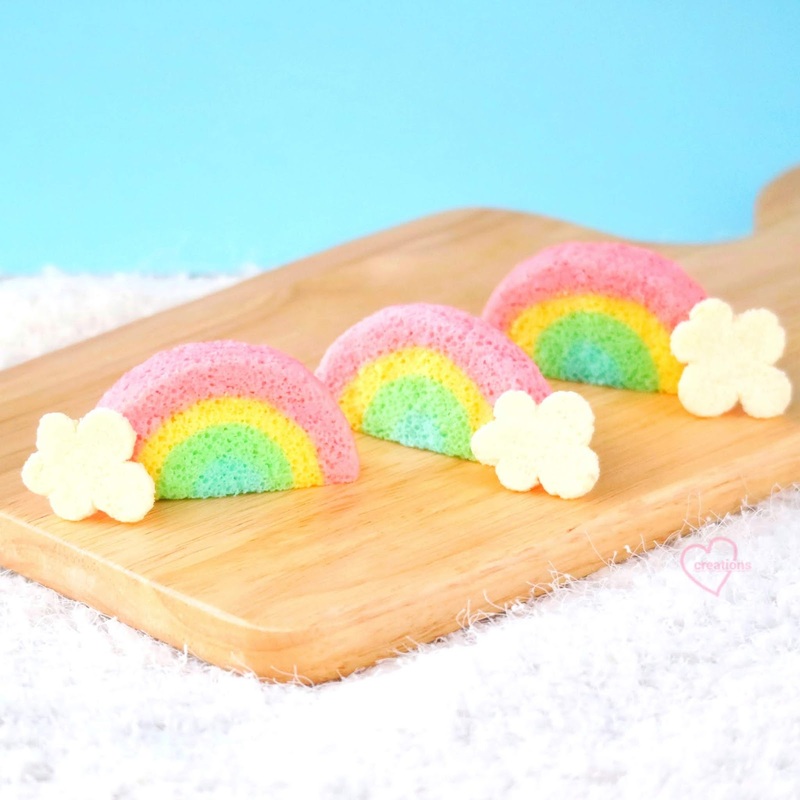 Slice a cupcake into 2 to make 2 rainbows! I used the largest souffle cupcake liners that I could find, but you can use any size, as long as you have sufficient space to pipe the lines. 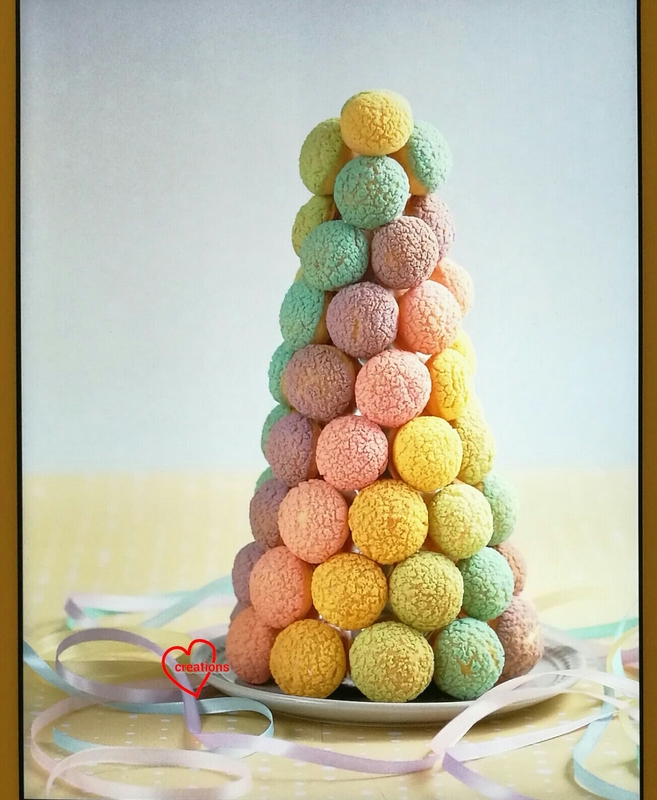 PS: If you want to make the chiffon cake pops look like the big chiffon cake rainbows, simply use a straw to punch a hole in the blue circle. 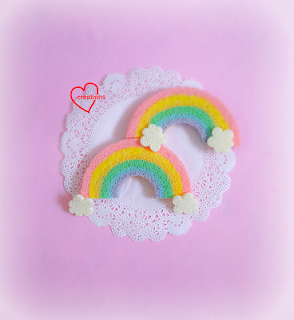 I actually had those rainbow versions, but my hubby said this version (without the hole) was cuter. 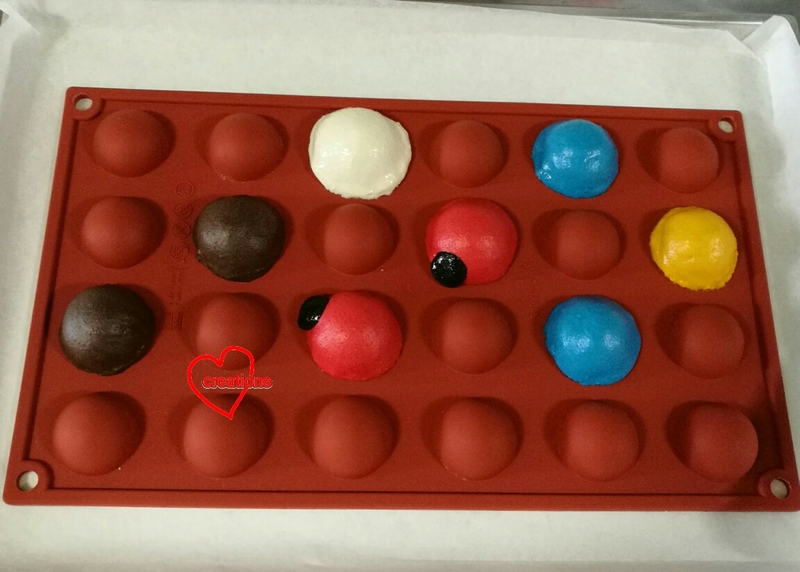 Hope you like the pretty and meaningful rainbow chiffon cake pops! The chocolate cake is not just any chocolate cake. 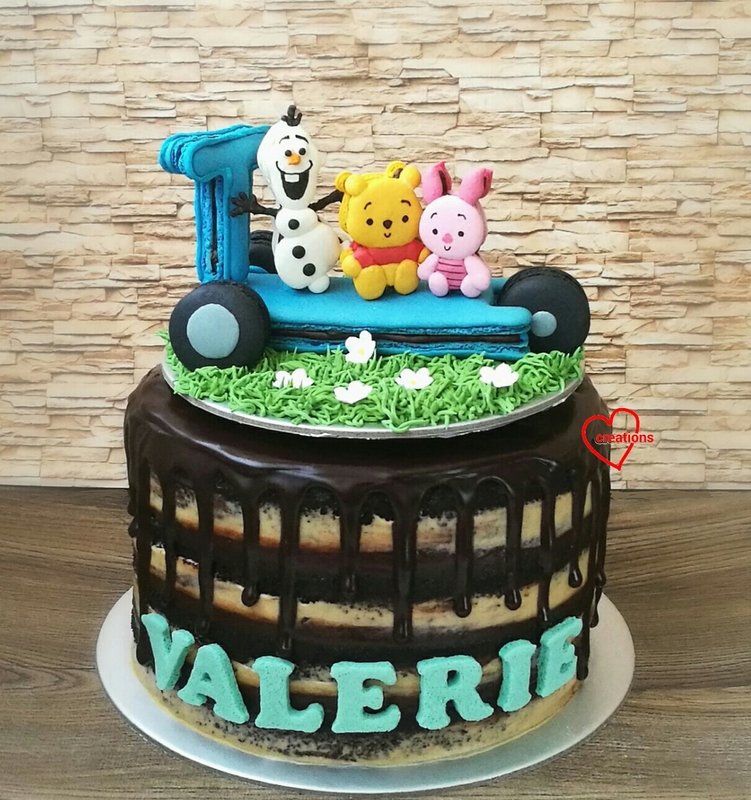 It's a wickedly dark chocolate cake with character! I made four layers of Rose Levy Beranbaum's German chocolate cake with a mixture of chocolate custard and whipped dark chocolate ganache filling between the cake layers, topped off with dark chocolate drip and a little salted caramel white chocolate whipped ganache on the sides of the cake just to give a little colour contrast and variation in flavour. Mdm Rose's chocolate cake recipe although chocolatey, is oil based and dairy free so I decided to make a richer custardy filling to compliment this dense in texture but light-on-the-palate sponge. Be prepared for a long post because of the many components involved in this bake. Piping the characters. 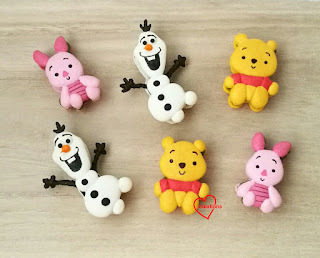 I piped Olaf’s arms separately and also added some cornflour to the batter to make it less prone to breaking. I filled them with matcha white chocolate ganache or dark chocolate ganache, both whipped versions for a lighter texture. I forgot to mention that the details were added on using black edible marker or royal icing. Here's a peek at the feet on macaron shells! Olaf's arms are stuck into the filling. And of course, it is really satisfying to see the fully constructed piece! I glued the pieces together with stiff royal icing. The German chocolate cake recipe is adapted from Rose Levy Beranbaum's Heavenly Cakes recipe book. I used smaller sized pans (7.5" diameter) but baked four layers of sponge (instead of two 9 x 2" pans in her original recipe) so I scaled the ingredients accordingly. I took the liberty of adding a coffee liqueur and reduced the sugar by about 5%. 1. Preheat oven to 175℃. Line base of baking tins with parchment paper. Mdm Rose suggested using cake strips for the baking tins. I just place a tray of water at the base of oven to create steam and a similar effect of slowing down the temperature rise of the cake tins. 2. 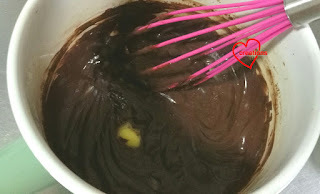 In mixing bowl, whisk cocoa and boiling water until smooth. Cover with plastic wrap to prevent loss of moisture through evaporation. Leave to cool to room temperature. About 30 minutes. 3. Add yolks and oil into mixing bowl. Use electric mixer to beat on low speed. Gradually increase to medium speed and beat for 1 min or until smooth and shiny like buttercream. Scrape down and beat in vanilla and coffee liqueur for a few seconds. 4. In a medium bowl, whisk flours, sugar, baking powder, baking soda and salt. Sift the mixture. Add half of flour mixture to chocolate mixture. Beat on low speed until dry ingredients moistened. Scrape down the bowl. Repeat with remaining flour mixture. Increase mixer speed to medium high and beat for 1 minute. Batter will be thick. 5. Add egg whites and beat on low speed until incorporated. Increase to medium high speed and beat for another 2 min. Batter will be like thick soup. 6. Transfer batter into prepared baking tins. They will be filled till about 1/4 full. Bake for 25-30 minutes or until toothpick comes out clean and cake center springs back when pressed in the middle. Immediately unmould the cakes and cool completely upright on wire rack. You may trim to tops of the cakes with a long serrated knife if there's a dome after cakes have cooled. Store between parchment paper in airtight condition until ready to assemble. I bake the cakes a day before assembling with filling. 1. In a heavy mixing bowl, whisk egg yolks with 1.5 tbs of milk from the portion above. In another bowl, sift together cocoa, cornflour, sugar and salt. Add the sifted mixture to the egg yolks. Whisk until a smooth paste forms. 2. Place milk, vanilla and coffee liqueur in a saucepan. Heat until it just starts to bubble at the edges. 3. Carefully pour the hot milk in a thin stream into the egg mixture while whisking continuously. This is to temper the egg yolks. Pour the mixture back into the saucepan. 4. Cook the mixture over medium low heat while whisking continuously. Once the mixture thickens, remove from heat and whisk vigorously until smooth. Return back to heat and continue whisking until custard is thickened to your preferred consistency. I usually cook for about a couple of minutes more. For this cake filling that is going to be mixed with whipped chocolate ganache, I cook until it is able to form soft peaks. For Choux pastry fillings, I cook until it is able to hold firm to stiff peaks. 5. Remove saucepan from heat and add butter. Whisk until butter is incorporated. 6. Reserve about 100-120g custard for coating each layer of sponge. Reserve 180-200g of custard to mix with 200g of whipped ganache. Press a piece of cling wrap on surface of custard to prevent a skin from forming. Chill in fridge and whisk to loosen before using. 1. Place everything in a heatproof or microwaveable bowl, depending on how you want to melt the chocolate. You may use double-boiling or microwave to melt the chocolate slowly. Stir until all chocolate is melted and the ganache is smooth. 2. Chill in fridge for 15-20min or leave out in air-con room until scoopable consistency. Whip with an electric mixer or spatula until lightened in texture. Be careful not to over whip or it will become grainy. 3. Fold in 200g of whipped ganache into 180-200g of chocolate custard. Reserve the rest of the ganache for frosting the sides and top of the cake. 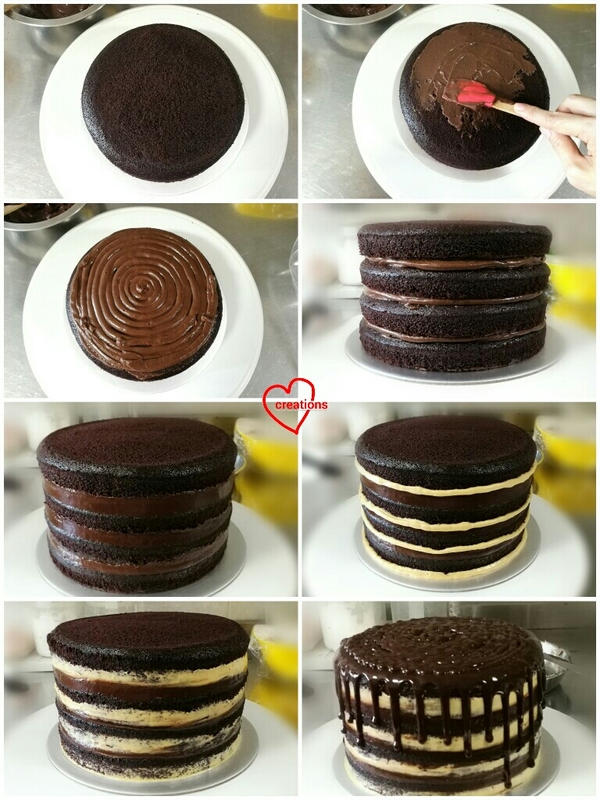 Transfer the portion of ganache for frosting the cake into piping bag with a small hole cut. Follow step 1 of whipped chocolate ganache above. Make this only after the layers of cake have been assembled and you are about to apply the drip on the cake. 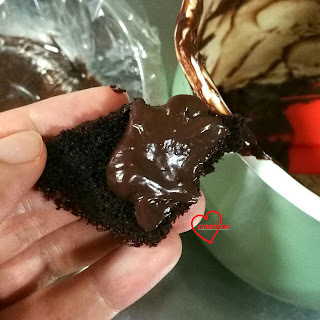 Transfer ganache into piping bag with a small hole cut when you are ready. Follow steps 1 and 2 of whipped dark chocolate ganache. Be even more careful not to overheat this as it's white chocolate based. Chilling in fridge should require a shorter time than the dark chocolate ganache as the chocolate to cream ratio is much higher here. 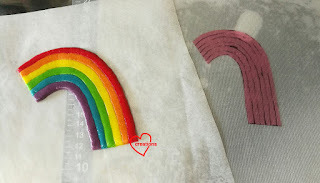 Transfer to piping bag with a small hole cut. 1. Place an 8" cakeboard on a turntable and apply a small smear of whipped ganache in the middle. Place a sponge on top. 2. Apply a thin coat of pure chocolate custard with a spatula. This will help to moisten the sponge. 3. Pipe the mixture of chocolate custard and whipped chocolate ganache on top. 4. Place another layer of sponge on. Repeat until all four layers of sponge are assembled. 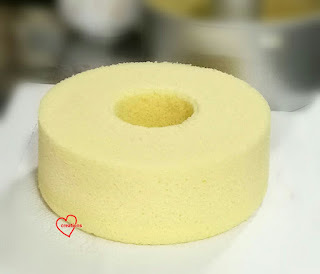 Gently but firmly press the top of the sponge downwards to squeeze out any air spaces between filling and cake layers. 5. Apply some whipped dark chocolate ganache to fill up any gaps at the sides of the cake where the filling layers are. Use a bench scraper to scrape off any excess ganache. You may choose to frost the top of the sponge with a thin layer of whipped dark chocolate ganache if you wish. 6. Pipe some whipped salted caramel white chocolate ganache as you wish. You may pipe the lines in a discontinuous fashion if you wish. 7. 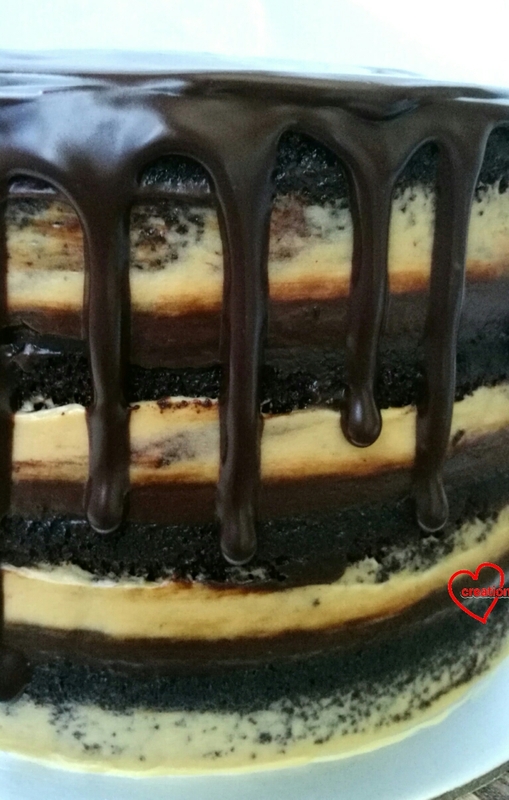 Use a bench scraper to scrape off excess salted caramel ganache and to smoothen out the frosting on the sides of the cake. I go for a rustic semi naked look so I don't have to care too much about being neat. 8. Apply the dark chocolate drip along the circumference of the cake. Try to turn the turntable and pipe at the same rate so that the spacing between drips is more or less even. Some drips can go longer than the others. I made sure there is sufficient space for the name near the base of the cake. 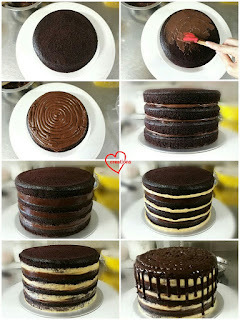 Quickly cover the top of the cake with more ganache and smoothen it out with a spatula. 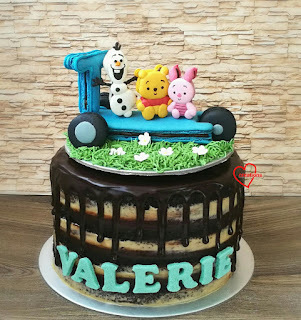 I don't work with fondant so I used vanilla chiffon sponge which I baked concurrently with an earlier request and used alphabet cutters to cut the name out. I used a little salted caramel ganache to glue the name on. 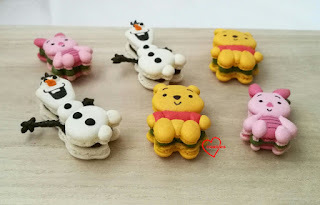 Do store macaron cake toppers and naked or semi naked cakes separately in the fridge as the moisture released from the cake will turn the macarons soggy quickly. Only if the whole cake is frosted with buttercream that doesn't contain too much liquid content should be placed in contact or same confined storage space as macarons. Just to share what I do in the kitchen when I work on bakes sometimes...I smeared some leftover chocolate custard on chocolate sponge trimmings to have a try...😋😋😋. Wickedly chocolatey! Do wait for a couple of days before eating the assembled cake to let the sponge and filling come together. It becomes more fudge-like and rich with storage! Let it sit at room temperature for a few minutes before enjoying all that chocolate goodness! Thank God the cake and macarons were very well received! Haha I have no idea what the mushroom is called actually! 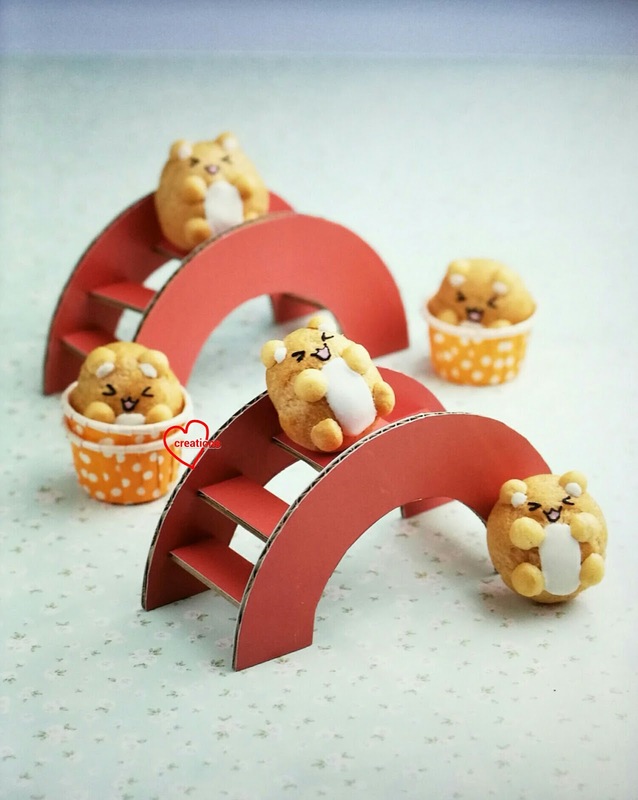 Except that it is very cute! 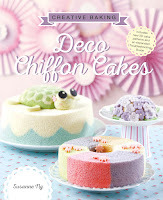 Recipe for the Mushroom cake has been shared here previously too, and is also in my 2nd cookbook Deco Chiffon Cakes (book cover below). Hope these make you smile! Have a blessed week! 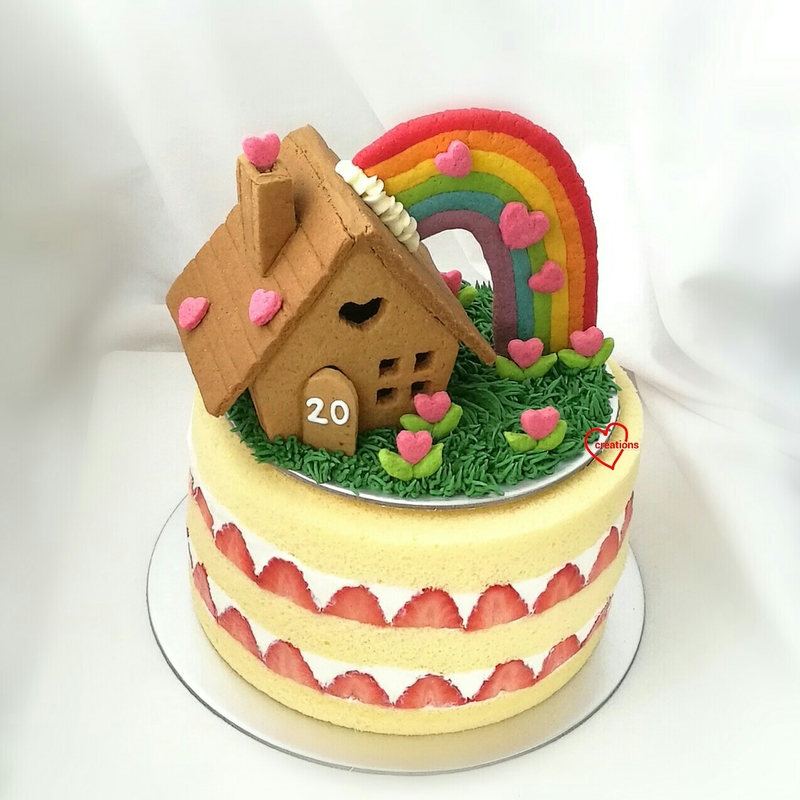 My friend wanted a bake from me to celebrate twenty years of marriage with her husband. We discussed what design would be nice and she agreed to my suggestion of creating a bake with a scene of a house with rainbow and a garden of heart shaped flowers to symbolize a loving marriage filled with hope because her marriage is one that is founded in Jesus Christ. She also misses my strawberries n cream cake so needless to say, she requested for it 😊. My friend is also prediabetic so her request involves making something that is delicious but not too sweet. 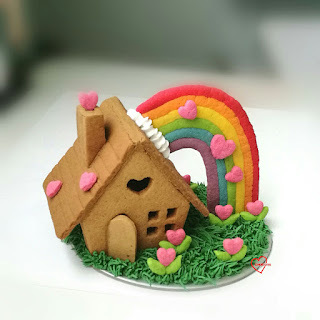 I used a healthy low GI sugar, Masarang arenga forest sugar, to make the cookie house, and used royal icing only as glue and for making the grass. 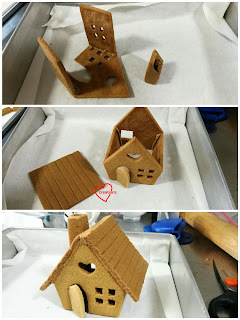 It is the first time I used a no-spread cookie recipe for a construction project as I needed something that has a better fit at the seams than my usual brown sugar cookie recipe which expands a little during baking. I adapted the recipe from here. I am also going to share how I make and bake cookies without standard cookie cutters. This recipe is excellent for handling as it's not really sticky and doesn't need to be chilled. I was skeptical about how the texture would turn out as it doesn't use a lot of butter and uses no leaving agent. But the addition of cornflour does wonders to the texture! 2. Cream butter and sugar using a spatula until just smooth (you don't want it to be too airy). 3. Mix in egg a little at a time until incorporated. Add vanilla and mix well. 4. Add plain flour, cornflour, salt and mix together with spatula. Mixture may seem dry at first but after a few minutes, it will gather into a ball and pull cleanly from sides of bowl. Knead by hand to bring dough together if necessary. Add food colouring at this point if you are using it. 5. 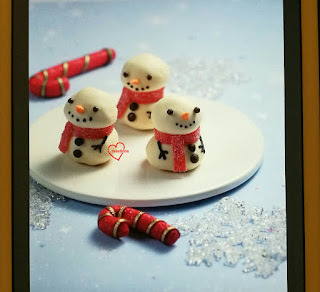 If baking recular cookies, roll to 5-6mm thick between parchment paper. If making cookie consturction projects, roll to 4mm thick. You don't want the cookie pieces too thick for construction projects as they may end up really heavy and the weight of it may cause it to sag or break. 6. As the dough is not chilled, it is rather soft but still not difficult to handle. Even then, you at want to avoid transferring cookie cutouts from work surface onto baking tray as the shape of the cookie cutout would have deformed by then. Instead, portion your cookie dough such that it can fit into your baking tray after rolling between parchment paper. 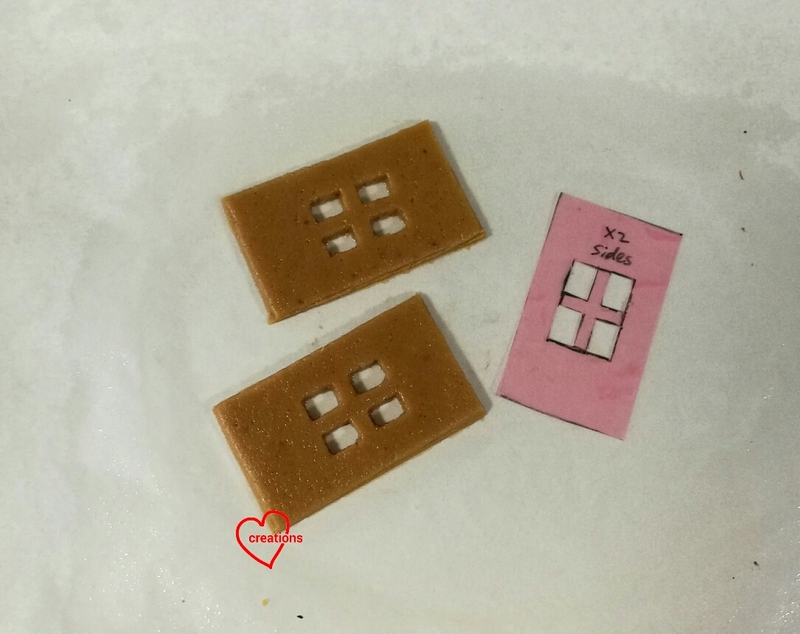 Use cookie cutters or homemade plastic templates (pink plastic piece in the picture below) to cut out the shapes using a small knife. Cut similar sized cutouts on each tray. 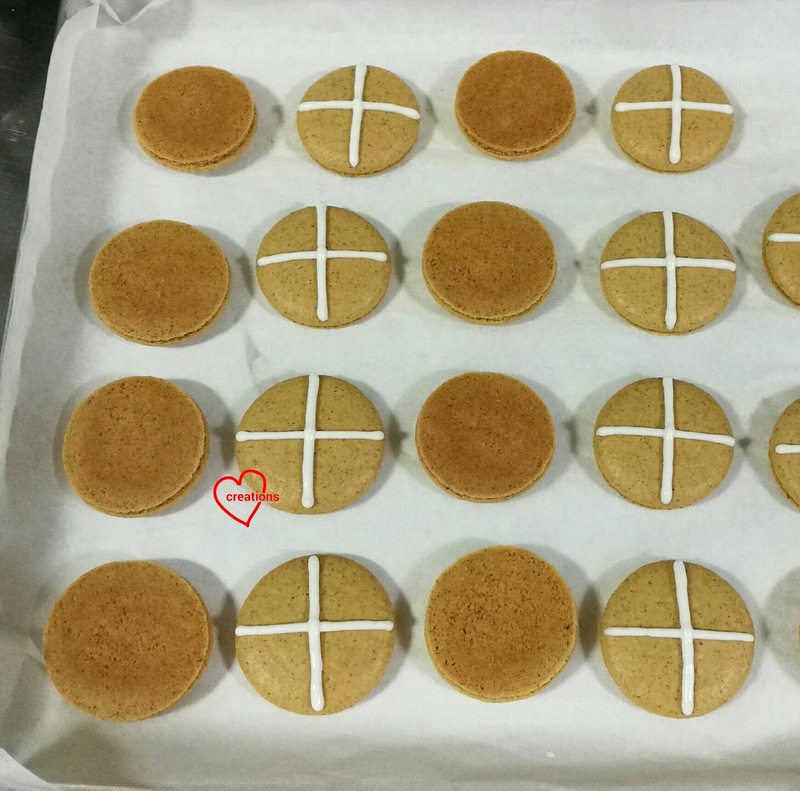 If you have a large cookie and small cookie cutout on the same tray, the larger cookie will underbake and small cookie will overbake. 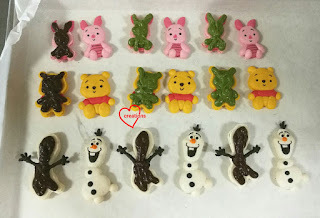 You can place the cutouts fairly close to each other as the cookies won't spread in the oven. Remove the excess dough around the cookie cutouts. 7. Bake in the oven until it appears dry and crisp. I can't give a specific time as it really depends on size of cookie cutout. The teeny heart flowers took about 6 min to bake (but at 160℃) The chimney pieces about 7-8 min, the larger pieces like rainbow and roof pieces took about 20 min but I lower the temperature to 160℃ after the first 12 min to prevent excess browning. You can always put the cookie back in the oven to bake a few minutes longer if it still looks underdone. Cool on baking tray for a few minutes before transferring to wire rack to cool completely. Store in airtight container. Just a note on the rainbow...I created it differently from the rest of the pieces. I rolled each coloured dough into long sausage shape and placed my template under the parchment paper so that I know how each colour should be shaped. I just remove the plastic template before baking. Do brush a little egg white between different colours so that the dough will stick together. Gently but firmly apply pressure to make them stick together. Prepare stiff consistency royal icing for gluing the pieces together. I coloured it to a colour close to the house so that the seams are less obvious. Assembled house that is lacking the number "20"
The recipe for vanilla chiffon cake can be found over here. I used the exact quantities so I won't repeat it in this post. 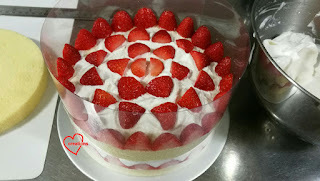 I used a 17cm chiffon tin and covered the hole of the cake with separate sheet cake cutouts. 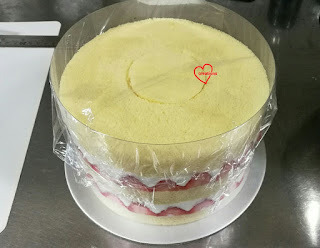 I have also shown you how to slice the cake into three layers so I won't repeat it in this post. I made the filling differently from my attempt last year as using full dairy cream although yummy, was quite nerve wreaking to work with in Singapore's hot weather. I was not too keen on using non-dairy whipping cream although it is much more stable because they come in really huge packets, doesn't taste as good as pure dairy cream (contains mostly oil, sugar, stabilizers and flavourings) and I didn't know that leftovers can be frozen 😆. I learnt something new from a fellow homebaker that it can be frozen. That means I don't have to worry about throwing away the rest of the packet when I am unable to finish it. I used a combination of dairy and non dairy cream here to have the best of both worlds, stability and better taste. I omitted sugar as non-dairy cream already has sugar added. But I added some gelatin to improve the stability. And I am so glad I tried this! 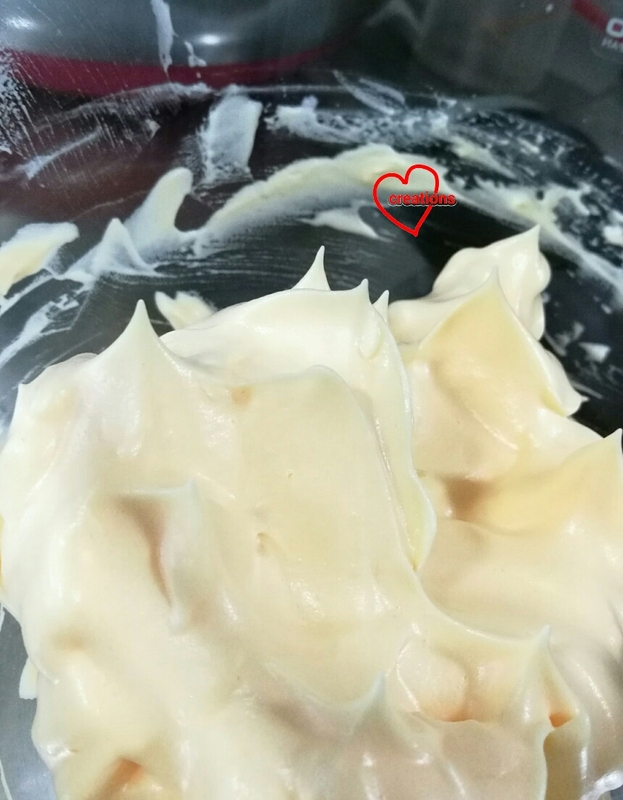 The resulting cream is stable at Singapore's tropical room temperature, not too sweet, and is light in texture 😊. Although my previous experiment using white chocolate and gelatin as stabizers worked beautifully in the stability department, it is richer in taste and heavier on the stomach so this is great for people who prefer something lighter. 1. Pour both whipping creams and vanilla into a tall mixing bowl. Mix the contents well, cover bowl with cling wrap and chill overnight in fridge. 2. Place water in small microwaveable bowl. Sprinkle gelatin over the surface of water. Let the gelatin bloom for 10 minutes. Microwave on medium power for 10 seconds. Stir until all gelatin is dissolved. 3. Scoop 1 tbs of cold cream mixture and mix it with melted gelatin. Mix well. Set aside. 4. 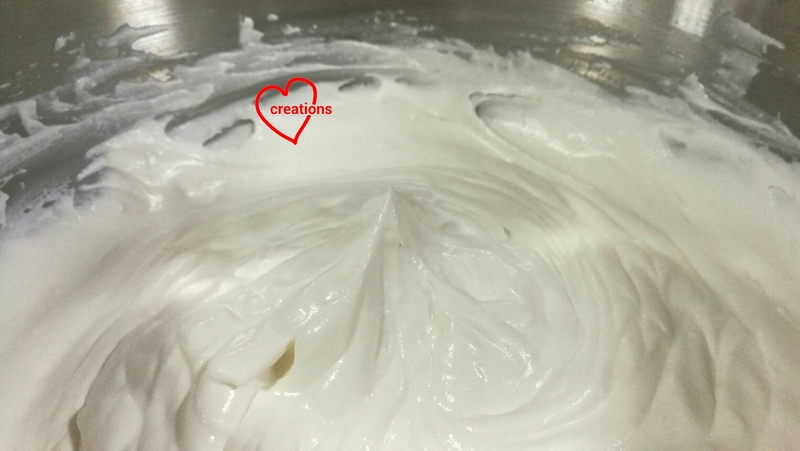 Use electric mixer to whisk cold cream until soft peaks form. Gradually add gelatin mixture while whisking the cream by hand. Continue whisking by hand until stiff peaks form. Properly whipped cream should still appear smooth but able to hold a peak. If it is clumpy, it has separated. I use acetate sheets as removable cake ring for cake assembly. You can buy from baking supply stores. Details of assembly can be found in my older post as well. The arrangement of the strawberries here is better than what I did previously so follow this instead. 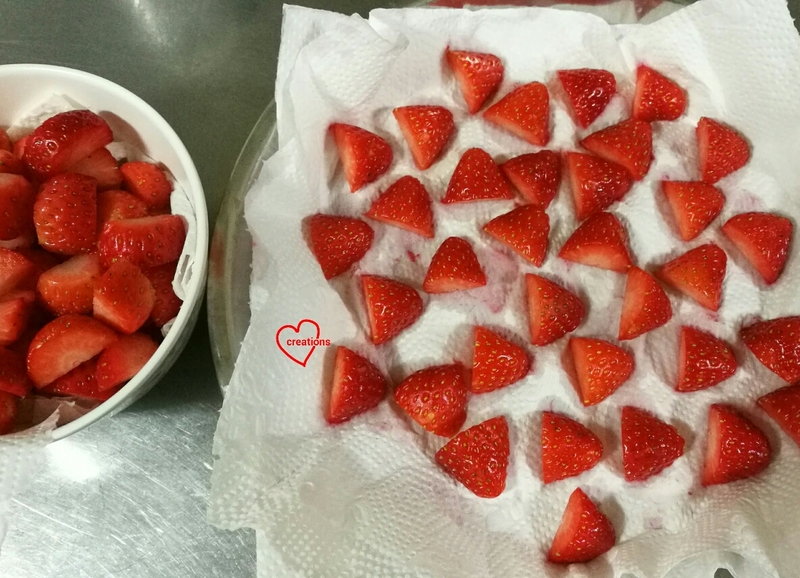 Make sure you press the strawberries against the acetate sheet so that cream doesn't come between the strawberry and the sheet. Covering the assembled cake with cling wrap on top to chill for two hours. Finally had the courage to try Luffy, my favorite character from One Piece! Even among my creations, I have some favorites and this is one of my new favorites! I was very thankful of the outcome as I was always apprehensive of making more complex human characters as they require more attention to detail, and it is not always easy to capture their expressions accurately. I thought this Luffy did have that wide-eyed carefree grin characteristic of him, so I was very thankful. 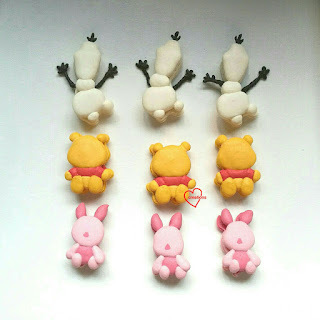 The character also has many different colours and features to put together. I guess making the Chopper Chiffon Cake gave me some courage! And I thank God it worked out. 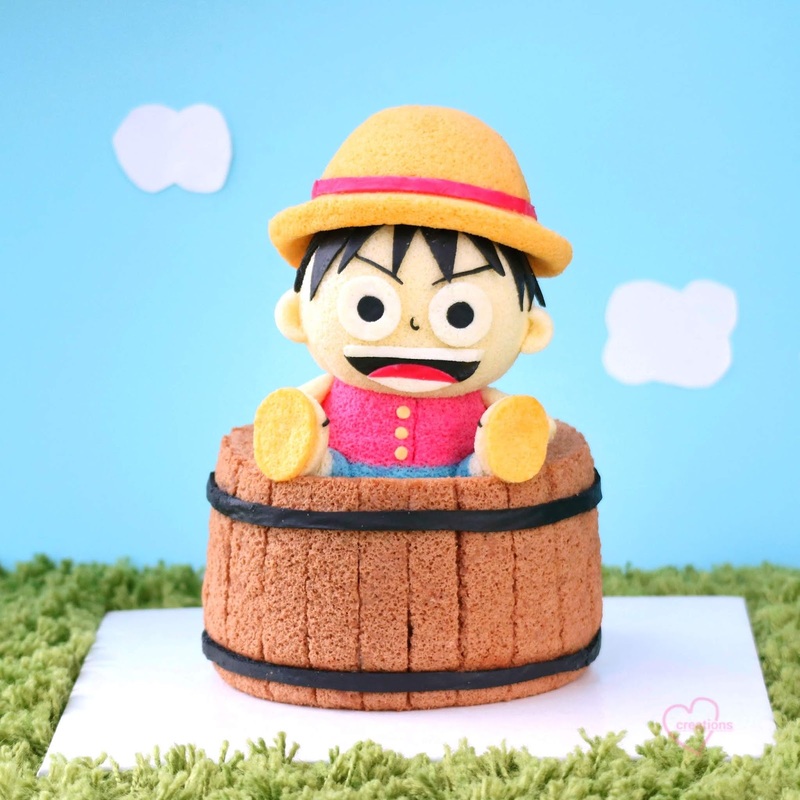 The recipe for the Wood-style crate Chiffon Cake he is sitting on has been shared here. Hope this creation brings a smile to your faces too! I am a One Piece lover =p. 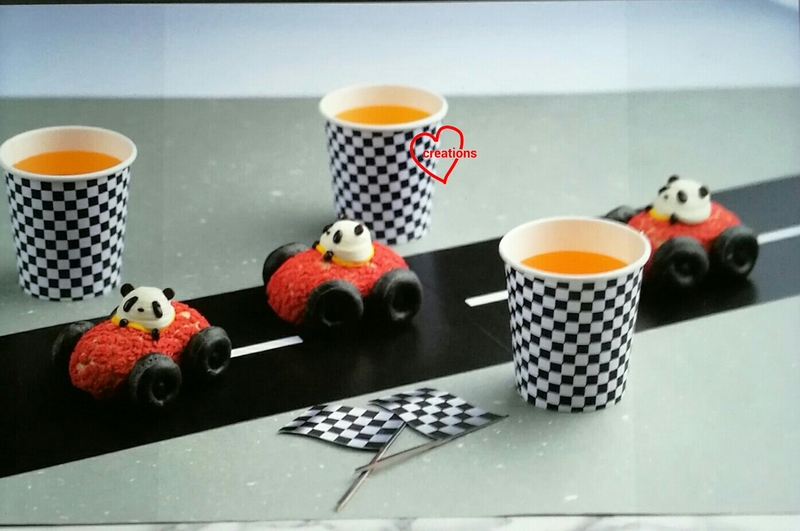 Are you wondering what special treat to make for your mother for Mother's Day? Especially if she's a fan of azuki beans with Matcha! 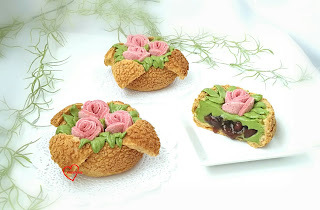 Why not join me for a 2-in-1 dessert class, -- pots of Choux au Craquelin filled with Matcha whipped ganache and Azuki beans, topped with Azuki bean chiffon cake roses! You will learn how to make two genres of bakes in this class, namely chiffon cake and Choux pastry in this 4-hour long class. I will teach you how to create these edible roses from a thin layer of azuki bean chiffon cake, how to make a basic large choux au Craquelin, and how to make a simple matcha whipped ganache filling that goes well with both chiffon and Choux. There's a generous dollop of whole azuki beans in the middle of the pot too to add that contrast in flavours and textures! Although it's a longer class, what I teach will be the basics for each genre. Many of you may not know that I have been experimenting with super low sugar macarons for the past two to three years. I have tried a variety of substitutions and have always met with failures. Many have tried sugar substitutes but 100% of the verdict is it's bad tasting so don't bother trying. 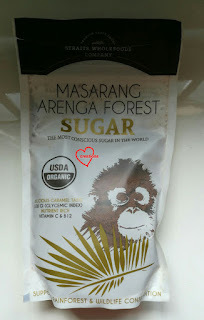 Those of you who have attempted cutting out sugar will also come to a conclusion that while zero sugar is not possible, low sugar is, but how low can you go?...That is the question which I think I have found an answer to. Presenting my version of hot cross bun macarons, with hidden heart candied cherry! 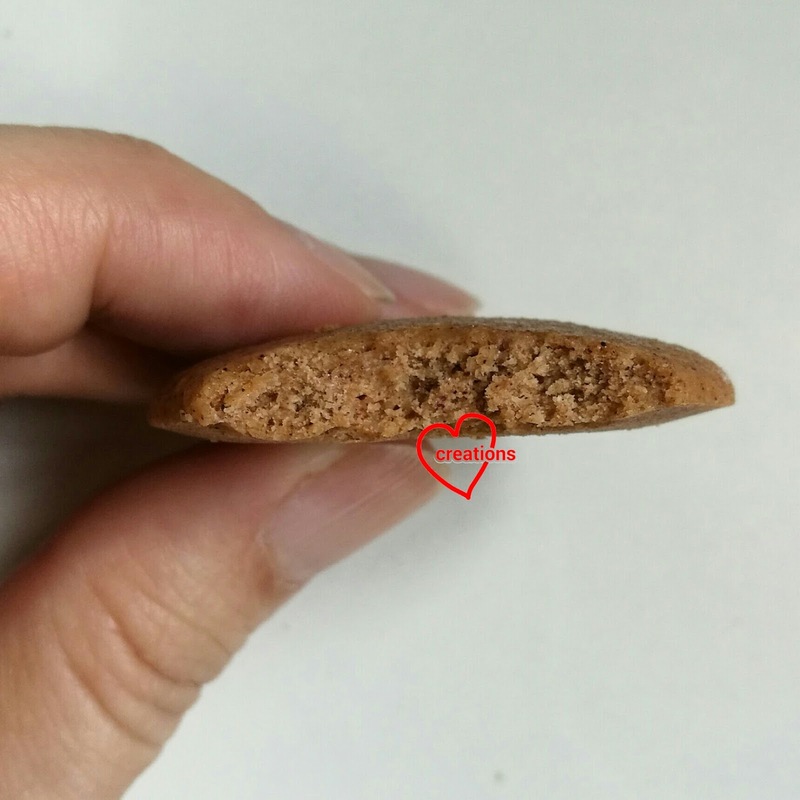 Before I delve into the topic of low sugar macarons, let me explain why I hid a heart in there. It's my personal preference to make something Christian themed for Easter. 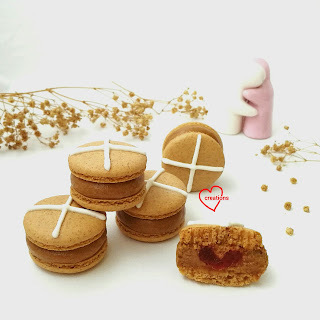 I thought of making simple spiced macarons hot cross buns style as a reminder of what Good Friday/Easter is all about -- God’s love for fallen mankind shown through the death of Jesus on the cross. And what better way to have both heart and cross in each macaron than what I did 😊. 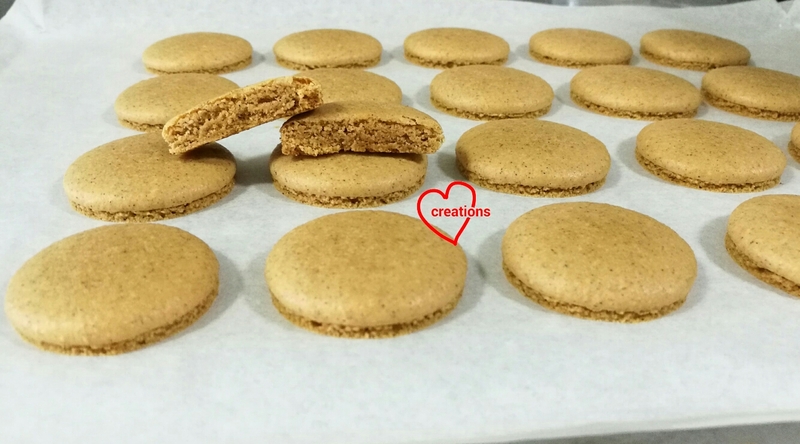 I filled the macarons with a spiced cream cheese based filling and used a delicious low GI sugar, so overall the whole macaron is not too sweet but oh so fragrant and flavourful! Let me explain why sugar is necessary in macarons. Macarons are meringue based cookies and meringues need sugar for stability. Take sugar out and the meringue collapses easily. You may add an acid like cream of tartar, or semi cook the egg whites (Swiss and Italian meringues) to improve the stability of the meringue, but some sugar is still necessary. Icing sugar also gives macarons the melt-in-your mouth texture. The higher the icing sugar content, the more delicate the texture will be. As I reduce both icing sugar and caster sugar in my low sugar recipe, you can expect that the resulting texture will be less delicate but that's a small price to pay when the overall sugar content by weight is 35%! Most recipes have sugar taking up about 50% of total weight of ingredients. Some recipes have percentages that are even higher. I have chosen the Swiss meringue method for creating low sugar macarons as it is more stable than French, and therefore requires less sugar in the meringue to be stable, but less complicated than Italian. My older reduced sugar recipes for French, Italian and Swiss methods involve substituting part of icing sugar with rice flour and cornflour, which I adapted from for this low sugar recipe. How does this recipe differ from my older ones then you may ask. I substituted very safe amounts of icing sugar with rice and cornflour, while keeping the caster sugar amount relatively constant for my older recipes. 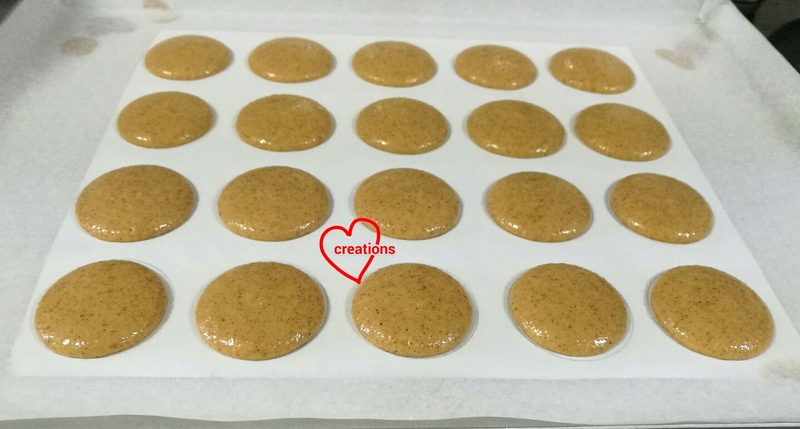 In this recipe, my starting point is from my failed attempts, gradually increasing the amount of sugar until what comes out of the oven resembles a proper macaron with full shells. 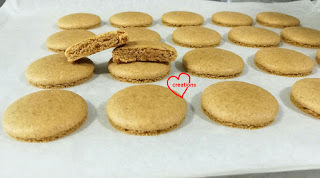 Without further ado, let me share the low sugar macaron recipe, and a yummy low GI macaron filling! Feel free to upsize the recipe for macaron shells once you have adjusted the baking process to suit your environment and oven. 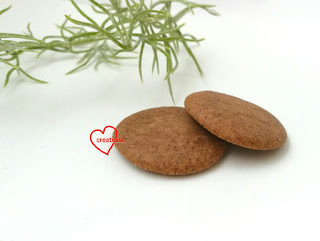 * Omit these items if making plain macaron shells. 1. Line baking tray with template and parchment paper. Stick parchment paper down with some batter later on when you have made it. Preheat oven to 60-70℃. Set oven to second lowest rack. I use top and bottom heat only. 3. Make the Swiss meringue. Place 36g egg whites, caster sugar and cream of tartar in a clean metal or glass bowl. Set the bowl over a saucepan filled with some water. Make sure the water doesn't touch base of the bowl. Heat the water in saucepan using low or medium-low heat while whisking the egg whites. Use a candy thermometer or infrared thermometer to monitor the temperature of egg whites. I must stress that you should heat the egg whites slowly to make sure that all sugar is dissolved or your meringue won't turn out right. Heat the egg whites to 50℃. This should take about 5-8 min of continuous whisking over the stove. Remove from heat and beat the meringue with electric mixer on medium-low speed until stiff peaks form. Add gel food colouring and beat until evenly coloured. I don't use high speed to beat as a meringue that is built up slowly is more stable and has less large air bubbles in it. In fact for this attempt, I alternated between hand whisking (with the balloon whisk of my electric mixer) and beating with electric mixer to make sure that the meringue is always smooth and air bubbles are tiny. This is how you test for stiff peak. The meringue should be upright at all points where you test, not just in the middle of the mixing bowl. Meringue should appear smooth and glossy, and the meringue should be able to form a foamy lump that keeps its shape when you use a spatula to gather it in the middle of the bowl. 4. Transfer the meringue into a bowl with wide base for an easier macaronage process. Scatter a third of powdered ingredients over the meringue. Fold gently until incorporated. Repeat for the other two-thirds in two batches. 5. Once the dry ingredients are incorporated, add 1g of egg whites and mix well. Those of you who have made macarons before will notice that the batter is thicker than your regular one. This is because there is a significantly lower percentage of sugar in the batter. Adding a little egg whites at the end will help to loosen up the batter a little. Continue by pressing the batter against the side of the mixing bowl to deflate the batter. You may refer to this video tutorial for the macaronage technique. Be careful not to overdo the deflating as the meringue doesn't contain a lot of sugar. Check the consistency after each round of pressing the batter against the bowl. Instead of your usual lava consistency that you look for in regular macaron batter, you check the consistency by creating peaks in the bowl of batter and tapping the bottom of the bowl. If the peaks melt back into the batter, you are good to go. 6. Transfer to piping bag fitted with a Wilton #10 or #12 tip. Pipe rounds. Rap the tray on table to flatten peaks. Use toothpick to pop any stubborn air bubbles. 7. Dry in the warm oven until a membrane forms that does not feel sticky when you run a finger across the surface. This can take 10-25 min. Check every 5 minutes after the 10 minute mark. You may ask if it is all right to dry in air-con room or out in the open (if you live in a low humidity area). It should be ok although I haven't tried it because it's really humid here even with air conditioning so it would take too long to dry for my liking for a macaron batter that does not have much sugar to stabilize the meringue. I try to keep drying time as short as possible for this batter to prevent hollows too. 8. Once a nonsticky membrane is formed, increase temperature to 130-140℃ and bake for another 18-23 minutes or until feet do not appear wet. This membrane should be able to provide some resistance when you press it gently but not hard like baked shells. Cool completely on baking tray before peeling parchment paper away from the shells. 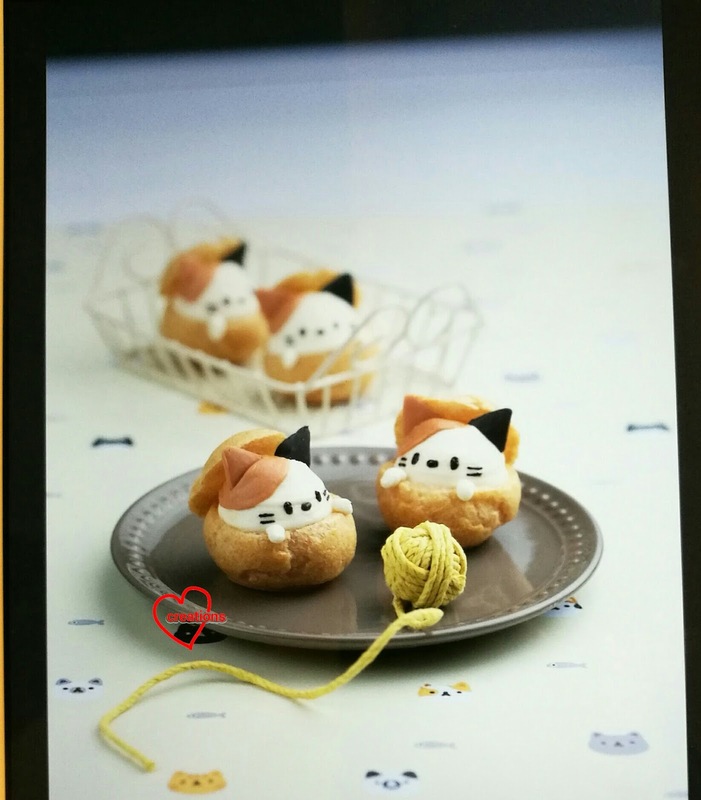 If you dried your shells in the open/air-con room, bake in preheated oven at 150℃ for 12 min and reduce temperature to 130℃ and bake for another 5-10 min or until feet no longer appear wet. I was jumping for joy at this beautiful batch! Nice even feet, relatively smooth tops and full shells!! With significantly lower sugar in the macaron shells, I wasn't about to spoil it by using a super sweet filling (definitely no American buttercreams for me! Way too sweet!). I chose a cream cheese base as it is able to hold its shape quite well in Singapore's hot weather, and its tartness compliments the sweet shells. I used relatively low amounts of sugar in the filling and chose a low GI source. ** Replace with brown sugar if unavailable. This is the sugar I used that is lower in GI but tastes great! It is similar to coconut palm sugar with a caramel flavour. 1. Beat cream cheese with electric mixer until creamy, smooth and soft. Set aside. 3. Add icing sugar, spices, zest, vanilla and salt and beat until well combined. 4. Gradually add whipped cream cheese and beat until just combined. Refrigerate for an hour or overnight before using. You may need to stir the mixture to make it creamy again after resting in the fridge. I decorated the macaron shells with firm royal icing (somewhere in between flooding and stiff consistency). Some people may find that hot cross buns are incomplete without sultanas in them so feel free to add some finely chopped sultanas to the cream cheese filling. In my case, I added a simple twist to it by inserting a piece of candied cherry in the middle. 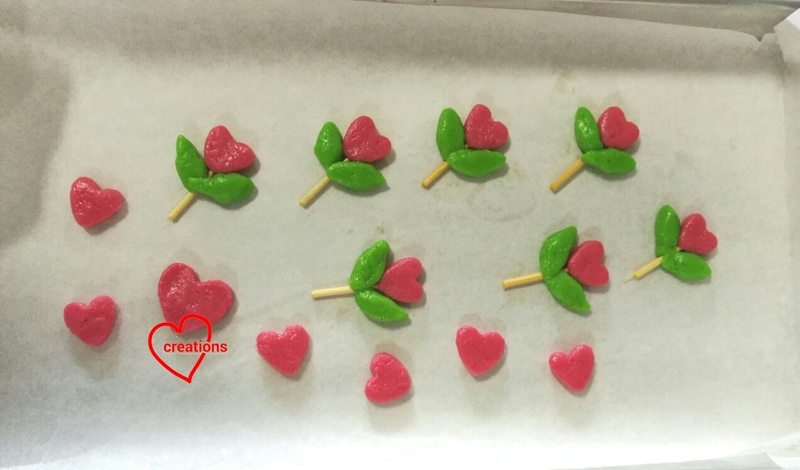 I halved the cherries and tried my best to cut it into a shape that will present a heart shape when you slice open a macaron. 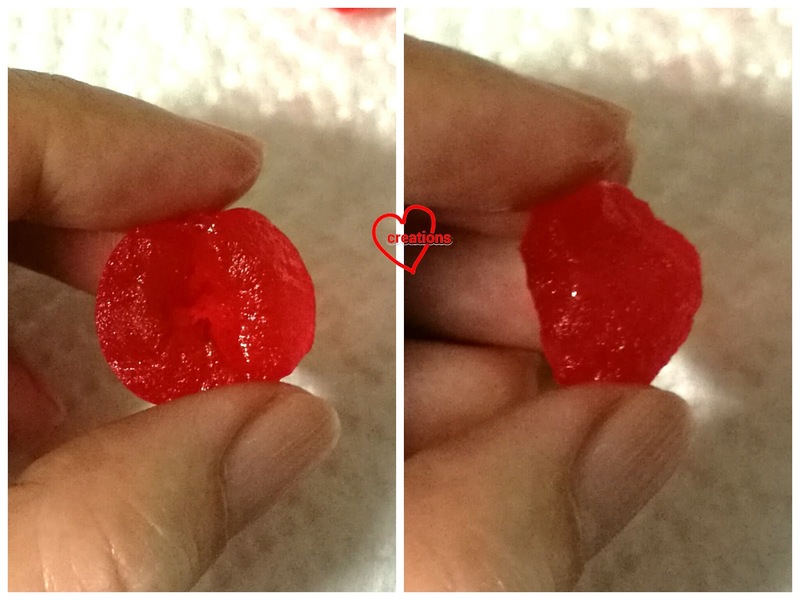 A halved candied cherry with conical bottom. I carefully reshaped the top as well to make it a little more rounded. Use only the bottom half of the cherry for this. Store filled macarons in the fridge in airtight condition for at least 24h. Let the macarons sit room temperature for 10 min before consuming to allow the filling time to soften a little. I am happy to say that reducing sugar by this much didn't change the texture too drastically! It's definitely less delicate than higher icing sugar content ones but not any chewier than some of my regular attempts. Longer maturing time with filling will make the texture more delicate so do wait for a few days before eating if you prefer it that way.